Today is “that” day. The day that I don’t think I can stand one more earnest, over-energized conversation. No more jockeying for attention, for making an impression on our tribe of travelers. And the jet lag swamp monster grabbed me. No sleep last night. I want to crawl under a dark rock, or like a cat, find the perfect (but not hot) spot of sunlight and curl up unfazed by the world around. We are at the border of Liguria and Tuscany (don’t the names just make you want to explore?) We are heading toward Carrera, a heady place if you love Michelangelo’s art as I do. 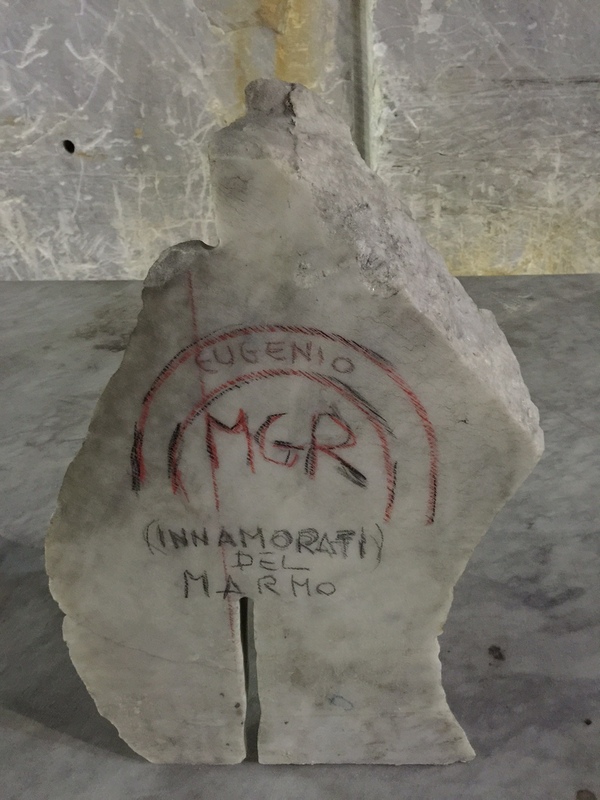 It is here that he chose his “statuorio”, the fine white marble he used for his sculptures. And though it came from Carrera, Michelangelo found the block for David cast off in Florence, it having been found to have flaws. When Michelangelo saw the block, he saw not the flaws, but David trapped within. And thankfully for all of us, he released him in all his magnificent glory. And in the inverse, the marble of Carrera seems to draw out the artistic energy of those who see it. It was the Romans who started excavating marble from Carrera, which they discovered in 177 BC. They had started building Rome using marble Pentlic marble from Greece. But its supply was limited, and so the Romans started to mine in Carrera. Quarrying marble was an art not widely practiced. The Romans solved this by bringing in slaves with the necessary skills from Mt. Pentelikon. Julius Caesar was the first to use marble from Carrera and the practice continued well beyond Caesar Augustus, who was the largest user. The Roman Forum was, in a sense, born in the bowels of this mountain. Unlike the dark realm of the dwarves, forging metal close to the heat of the earth’s core, the Carrera mines are a place of glistening beauty. The village of Carrera is completely surrounded by mountains. We pass into the valley and up the mountainside to the mines. Square marble blocks are scattered around the valley as though thrown by a petulant child giant. Twelve thousand people live in the village of Carrera now. 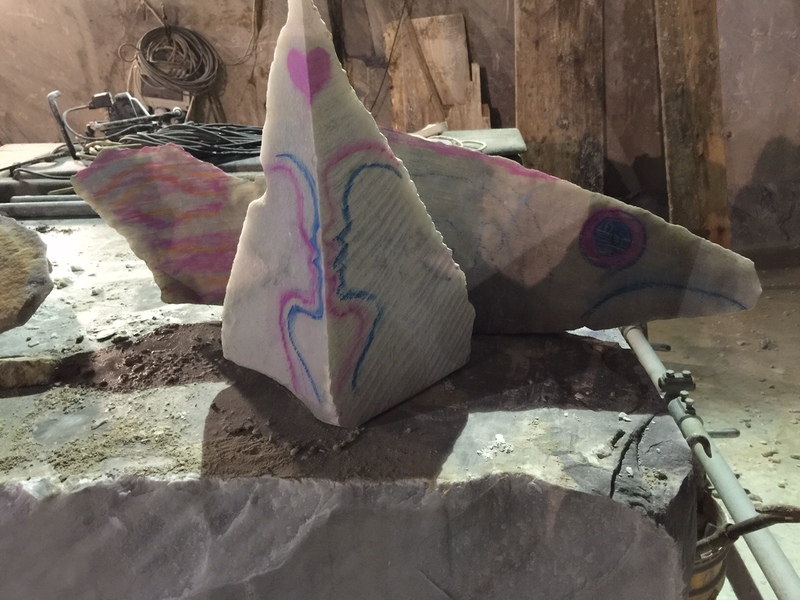 Most work in the quarries, but more and more artists are moving to the area. The quarrymen now live further away since transportation is easier, but the artists seem drawn to be closer to the marble. 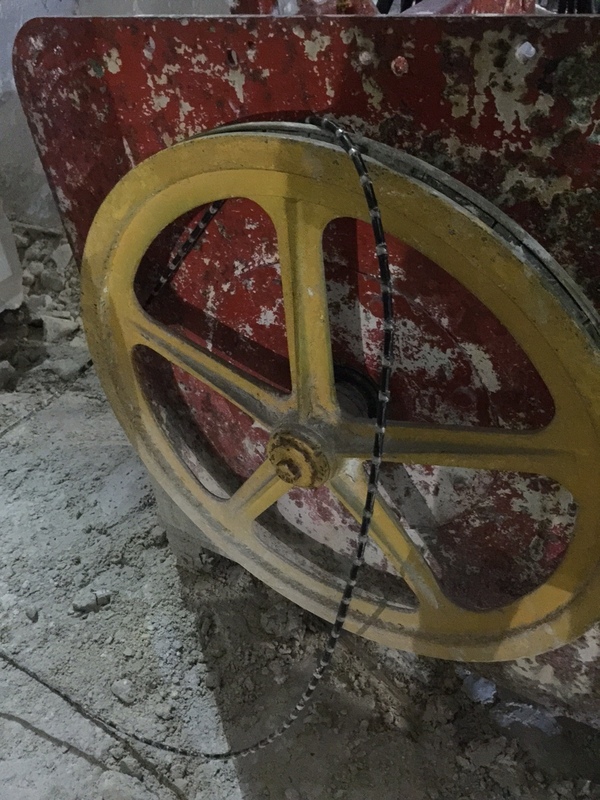 The marble stands in stark juxtaposition with the machinery used to excavate it. Marble blocks used to be removed by chisel and wet wooden wedges. In Roman times it took nine months to cut a block that it takes two days to cut today. 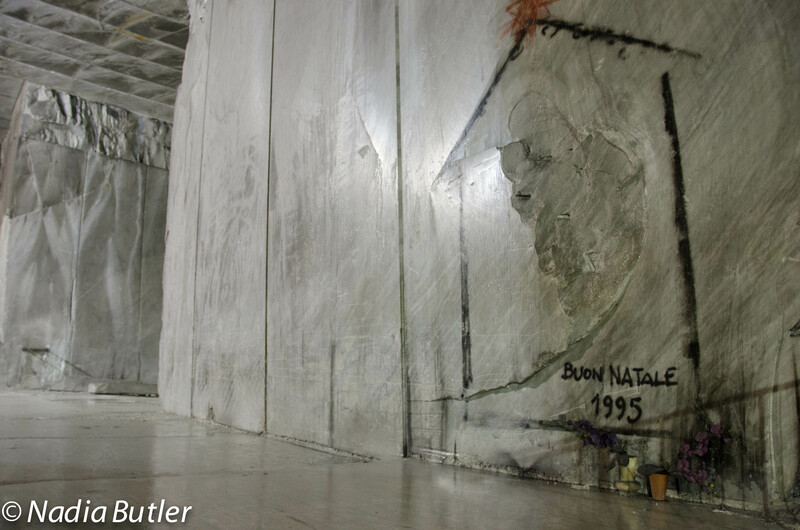 Up to 40 years ago, the marble was cut with iron wire, but now it is cut with wire encrusted with industrial diamonds. And with that change, more marble has been removed from this area in the last 40 years than had been since its inception over 2000 years ago. But in spite of the heavy machinery and the technological advances, the marble still holds its magic. 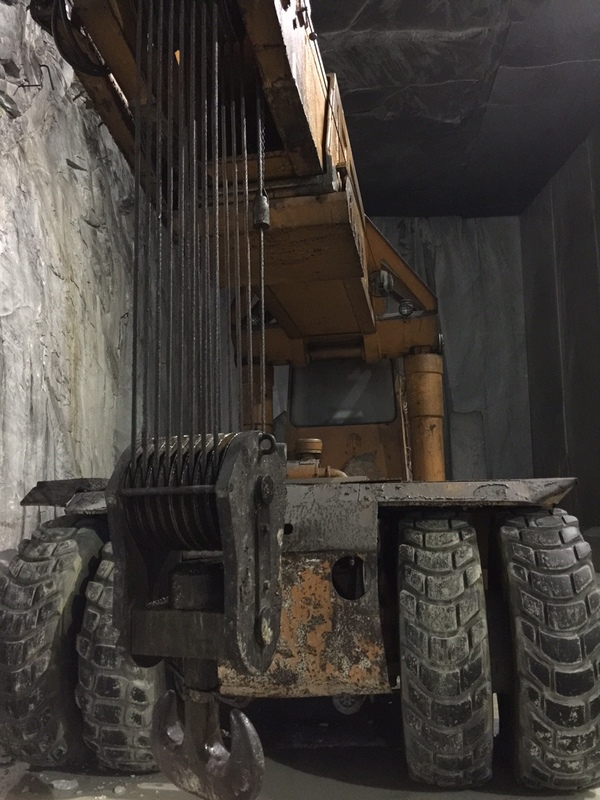 There is impromptu art throughout the mines, created by the quarrymen during their breaks. An accident on Christmas Eve, in which a large block fell away from the wall, leaving a scar that looks like the Madonna and child, has been turned into a shrine. Shrine established after Christmas Eve accident. And even the miners’ children, who on occasion visit the mine, have their own art table. Children’s art table inside mine. From these humble expressions of the love for this marble, to Michelangelo’s exquistie David and Pieta, Cararra marble exercise its power over our imaginations. Translation: Fell in love with marble. Thank you, Don. i really struggled with this one. I had to leave out a lot of stuff to maintain some cohesion. Nadia Butler: Writer AND Historian. DAVID. A supreme work of art achieved with confidence, knowledge, awe, love, and ( let’s face it) , holy lust. If anything, Ed, it’s not earnest or energized enough. David is magnificent. I still don’t understand how Michelangelo managed to make marble look as though you could feel a pulse if you touched it. I was brought to tears when I saw Pieta, even behind glass and further away than I would have liked. This lovely piece reflects not only the material and the art it enables but the people of marble. Thank you, Nadia. We passed by Carrera on the train several times, but did not visit so this feels like an extension of our trip and has added depth for us. I do wonder if the machines now used to mine the marble somehow impact its “life”. As you describe, there is no longer a skilled stonemason selecting the cuts and thus revealing what the stone has within. Such an apt observation, Susan. The personal relationship with the stone is damaged by the new technology, isn’t it? I wonder how many Davids or Pietas have been sawed through. What a disturbing thought! But I’m glad this added to your trip. Makes my struggles over this piece worthwhile. Just for you. Your writing is simply fantastic. What can I possibly say to that, except Thank you! Loved the Prosetry Ambiguity in the lead photo! Brilliante!! Thank you! I fell in love with the title when It presented itself to me. But it was difficult to imagine A companion lead in photo. I’m glad you got it.. Thank you, Joshi. That means a lot coming from someone with your eye. What a generous comment. Thank you!